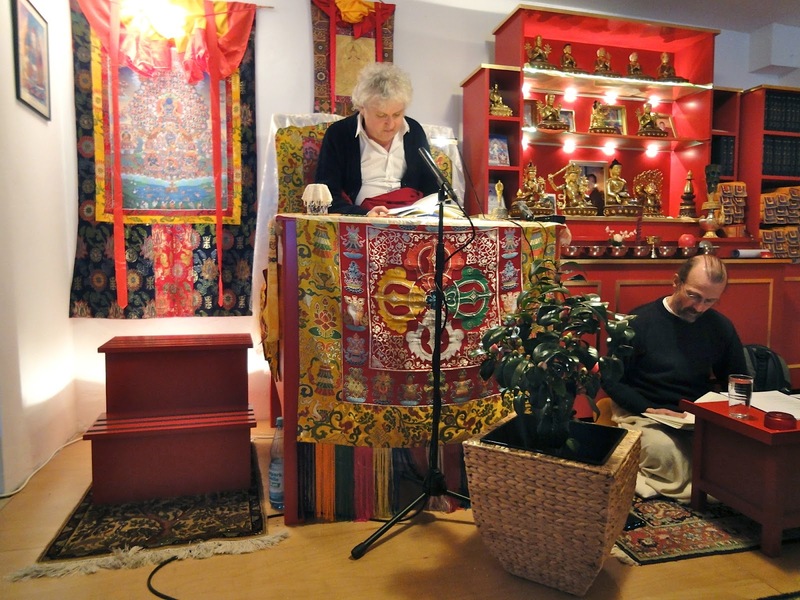 The Sakya Dechen Ling Sangha and Dharma friends were once again very happy and fortunate to be able to receive and host an auspicious visit from Lama Jampa Thaye in Stuttgart on 4 to 5 February. As an indication of his growing confidence in the establishment of a strong and vibrant centre of Sakyapa Dharma here in South Germany, Lama Jampa taught the second and final part of Bhavideva's '50 Verses in Praise of The Guru' along with the commentary written by the great 16th century yogin and scholar Tsarchen Losal Gyamtso, founder of the Tsarpa branch of the Sakya tradition. This wonderful text clarifies completely the importance and significance of the Vajrayana master, and being able to study it with Lama Jampa thus lays the foundations for us to be able to continue to receive an abundance of Vajrayana teaching in the future with full confidence and understanding. On the second day of his visit Lama Jampa then graciously bestowed on us the initiation of Black Manjusri. This special form of Manjusri is one of the 13 Golden Dharmas of Sakya. Along with the transcendental accomplishment of leading to ultimate enlightenment, this special Sakyapa deity bestows mundane accomplishments such as protection from fears, sicknesses, disturbing influences etc., all of which are most appropriate for Sangha members engaged in their daily lives, as well as helping to remove all possible obstacles and inauspicious constellations that may otherwise have hindered the continuing growth and stability of our beautiful Sakya Dechen Ling. As a fitting conclusion to the visit, the initiation was followed by a Tsok offering ritual to the Lama in the form of Guru Rinpoche. 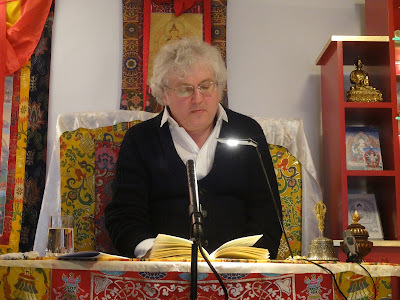 Despite the very cold and snowy weather, many people were able to attend both days, and Lama Jampa expressed his thanks for all the efforts being made by all involved in Sakya Dechen Ling, and informed us he will be returning to Stuttgart in mid-June to begin teaching the 'Telescope of Wisdom', which is the commentary written by Karma Thinley Rinpoche on the famous 'Letter to a Friend' by Nagarjuna.